I woke this morning thinking of Good Friday, and the Three Hours at the Cross. Note to self: create visual meditations on the wounds of Jesus and the sayings of Jesus from the cross, and revisit a visual meditation on the stations of the cross. Time for a change. I liked the black design through Advent, Christmas, and most of Epiphany, the banner image of the Liverpool Eye at night, the theme of light shining in darkness. But it is time for a change: something simple - and not dark. 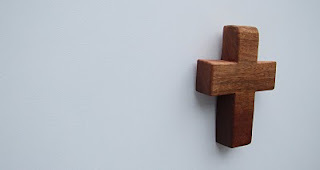 The new banner image is of a carved cross, a gift from my friend Jon, that I have hung on the wall of my study. Jon didn’t know it, but I was thinking that the wall needed a cross. I can’t even say why, exactly. But the gift, and the timing of the gift, have been a greater gift than could have been imagined. 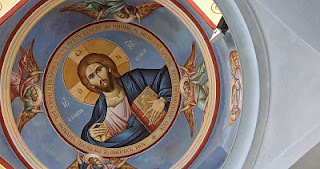 I’ve also added a banner image at the bottom of the page, a ceiling painting from the Monastery of the Temptation, built on a cliff edge close to the place where Jesus spent forty days and nights, immediately after his baptism in the Jordan, fasting and meditating on Moses’ address to the people before they entered the Promised Land, in preparation for his own invasion. The beautifully painted image of the risen Christ as ‘Lord of All’ is one that has held my imagination ever since I stood beneath it. The images in the sidebar – the circle, semicircle, triangle, square, and pentagon – have their own significance, and have become permanent features, fixed points around which the design can be adapted. Over the years this blog has undergone shifts in content as well as design. 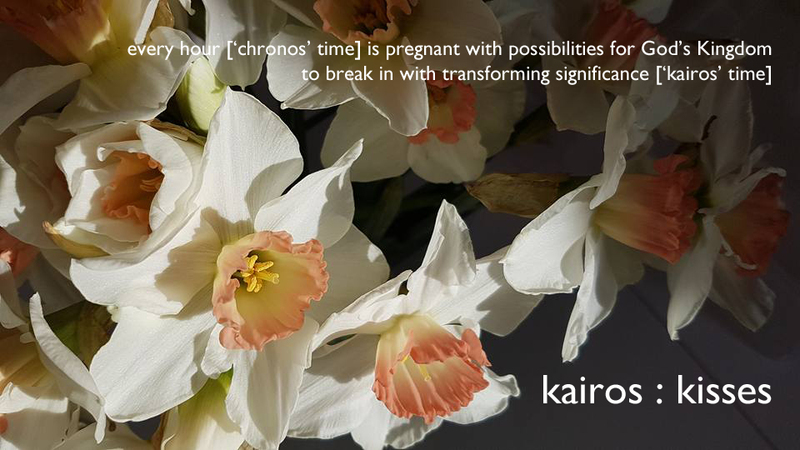 It is time for a change...and it might be even be time for a change. Overwhelmingly in the Bible the description ‘pure’ refers to gold, and to pure gold in a particular context: the tabernacle. God has rescued his people from slavery in Egypt, and they are living in tents in the desert at Mount Sinai. God calls Moses up onto the mountain to meet with him and declares his intent to dwell among his people in a tent of his own. Exodus chapters 25-31 record God’s design specifications. Almost everything inside the tabernacle is either to be made of pure gold, or made of wood and covered in pure gold. These items play a role in the interaction between God and his people: the ark of the covenant, the table on which offerings were made, etc. For seven chapters, God goes on about pure gold. And so pure gold signifies that the thing in question is set aside for God’s purposes – his purpose being that God and people can live together. Moses waits at the bottom of the mountain for a week, and then is gone for forty days and forty nights. The people decide that they do not know what has become of him, and that therefore they will make a representation of the god who rescued them. Moses’ brother Aaron instructs them to bring gold jewellery, given to the slaves as they left Egypt, with which he casts a gold calf. This misuse of gold angers God, and Moses, who on returning to the camp has the calf ground into gold-dust, the dust thrown on the water supply, and the people forced to drink this contaminated water. Then the camp is purified, in drastic measures: those who have not taken part are sent through the camp to kill their brothers, friends, and neighbours, and 3,000 are killed on that day. (This story is told in Exodus 32). A connection is established between pure gold and pure hearts before God. This idea, of pure gold symbolising pure hearts, is developed later on in the history of God’s people, in the time of King David and his son King Solomon. In the ancient world, royal courts where centres of learning. David, the musician, compiles psalms; Solomon, the wise man, compiles proverbs. The idea of pure gold symbolising pure hearts is expressed in both psalms and proverbs. Proverbs 17:3 goes further, declaring: “The crucible for silver and the furnace for gold, but the Lord tests the heart.” A connection is established between the process of purifying gold and the process by which God purifies the human heart. Interestingly, when Jesus appears in the story, he is described by John in these terms: “The Word became flesh, and made his tabernacle among us.” Just as long ago God had chosen to live in a tent among his tent-dwelling people, so Jesus living among us is described as the tabernacle. His flesh is like the tabernacle itself, and his total purity of heart like the pure gold inside the tabernacle. He is both God in our presence and the human who ministers to God on our behalf. James begins his letter to the persecuted church by writing: “Consider it pure joy, my brothers and sisters, whenever you face trials of many kinds, because you know that the testing of your faith produces perseverance. Let perseverance finish its work so that you may be mature and complete, not lacking anything.” (James 1:2-4). He goes on to contrast purity and impurities of various kinds. This, then, is the purifying process. Gold is heated in a furnace, and the impurities within it rise to the surface of the molten gold, where they are skimmed off and poured away by the goldsmith. In the same way, through the circumstances of our lives, heat is applied, and as we become increasingly uncomfortable the impurities within us rise to the surface. The things we would rather remained hidden, invisible within the gold. Things like anger; or evil desire; or ties of obligation to those who live opposed to God; or worrying about money, how we will eat or what we will wear. For example, when we are frustrated even by small ongoing things anger may come to the surface; when we are faced with serious or tragic circumstances, all kinds of reactions might surface. We have a choice: to allow these things to sink back into the gold when the pressure is relieved, so that we look good on the outside; or to ask God to purify us, so that we are changed. Purity is concerned with being set aside for God’s purposes, for his use, in order that people can live with God in their midst. Purity is single-hearted devotion. God’s intention is to purify us: to bring to the surface the impurities in our heart and to pour them away. On our part, this requires confession. On God’s part, this is not merely forgiveness in the expectation that we will not be changed but he will continue to forgive: this is about transformation. This is the process by which we are changed from one degree of glory to another: from 9-carat gold, through the various qualities to 24-carat gold. Can you identify impurities that God has removed from your heart in the past? Thank him for that work. What circumstances are testing you at present? What impurities keep rising to the surface? Ask God to skim them off and pour them away. Are you looking for ways in which you might be used for God’s purposes? Start each day this week dedicating yourself to him, making yourself available today. Today is Noah’s seventh birthday. Yesterday, we had a party. Jo made a(n enormous) LEGO-inspired cake. 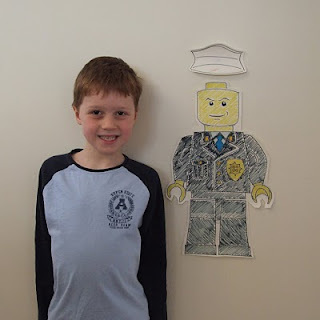 I made a pin-the-hat-on-the-LEGO-policeman. And Susannah played ‘Happy birthday to you!” on the piano. The son finds himself in a place that represents the absence of God – slowly dying, surrounded by pigs. From this place, he returns to his father as one who has sinned against heaven and against his father, who is no longer worthy to be considered a son but hopes to be a servant, this time of his father (for he has already become a servant). Instead, the father not only takes him back as a son, but elevates the younger son to a place of honour, putting upon him the best robe, a ring, and sandals – symbols of authority over the father’s entire estate – because he was dead and is alive again. When Jesus took upon himself the sins of the world he became sin, cut off from God, experiencing death and descending to hell. Although he lived without sin, he died the greatest sinner of all, carrying everything that separates us from God and neighbour. Here is the one who made himself nothing, who became a servant, and died. And who God – the Father – exalted to the highest place, in order that everyone should acknowledge the Son...for this is how the Father has decided that he himself will glory, in honouring the Son. That sounds to me like the same story, from two sides: the parable foretelling the story, and the hymn reflecting on it. And Paul introduces the hymn by saying that our attitude should be the same as that of Jesus Christ. The prodigal son, who squandered his father’s resources on sinners, is our role-model. 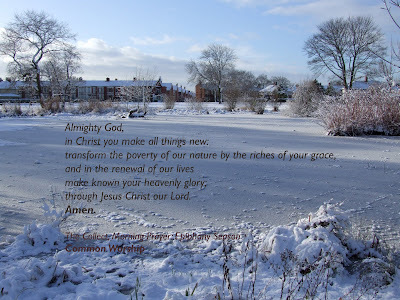 This is my favourite of all the seasonal prayers from Common Worship: Services and Prayers for the Church of England. I am convinced that Jesus’ parable in Luke 15:11-32 is the most routinely misunderstood of all his parables. It is traditionally known as The Parable of the Prodigal Son. ‘Prodigal’ means ‘recklessly wasteful’ or ‘lavish,’ and ‘prodigal son’ has come to mean a ‘repentant wastrel’ or ‘returned wanderer.’ More recently, the NIV translation used the section heading ‘The Parable of the Lost Son,’ bringing it in line with the two preceding parables, ‘The Parable of the Lost Sheep’ and ‘The Parable of the Lost Coin.’ The son has been presented as one who turns their back on God, lured away by the pleasures of the world, before eventually coming back to faith. Though the father does not try to force his son to stay against his will, he never gives up hope that one day he will return – and, in both regards, we look to the father as our role model in relation to friends or family who walk away. But I am convinced that this interpretation misses the point, and therefore misses the proper implications for us. Jesus contrasts the way the Pharisees despise those who do not live up to their own standards with illustrations of how precious each sinner is in God’s eyes. Having established this, he builds on this foundation [that is, the third parable does not underline the first two - note that it does not have the same ending, the same explanation - but goes beyond them] to speak about himself in answer to the accusations levelled against him. I am convinced that the younger son in Jesus’ story is his way of speaking about himself. The younger son asks for his share of the inheritance, sets off on a long journey to a distant land, and squanders his wealth in wild living. He leaves the Father’s presence in heaven, and comes to earth, where he wastes the resources of heaven not on those who would consider themselves to be deserving of such honour but on the undeserving. He lives in such a way as to be accused of being a glutton and a drunkard, a friend of tax collectors, prostitutes, and other sinners. He does not observe the ritual rules when it comes to eating, or the Sabbath. And his choices come with great personal cost. And Jesus contrasts himself – the younger son – with the Pharisees – the older son, who neither enjoyed the father’s goodness themselves nor shared it with others. Now, of course, a story can be understood at more than one level. And so it could be argued that we can see the younger son to refer to Jesus at one level while still seeing it as referring at another level to those who walk away from God – as referring to the majority interpretation, the common understanding. But that understanding has such a strong gravitational pull on our imagination, and the context is so clearly a confrontation between two views of Jesus – from the devil or from God? - that I just don’t think a dual interpretation will do. It will always pull us away from who Jesus is. Rather than the father being our role-model, in letting-go and hoping, I would suggest that the prodigal son is meant to be our role-model. That we should reclaim ‘prodigal’ as a model for the missional life [that is, living a life defined by mission]: ‘prodigal’ applying not to those we hope to see come back, but to us as we go out. How much of heaven’s resources are we prepared to ‘squander’ on sinners? How far from home [from our place of comfort] are we willing to go? How great a personal cost are we prepared to pay? Whose rules are we prepared to break, and who are we prepared to offend, in order to live prodigally? ...but we have been blessed! Top: the view from our house. Middle: view of our house (first house on the right). Bottom: view of the church. January 1 is the feast of the Naming and Circumcision of Christ. You can read about these events in Luke 2:21-40. My eyes have seen your salvation. Have seen. This is important. Evangelicals tend to over-emphasise the cross as the place of salvation, Jesus’ death as the work of salvation. But that is only a part-truth and, like all part-truths, to put more weight on it than it can bear results in heresy. If salvation occurs at the cross, Simeon had not seen it. Our salvation is not found at the cross, or any other single event, but in the person of our saviour, Jesus. By Jesus’ birth God saves us from darkness, from despair, from the heart-sickness that results from having our hope endlessly deferred. By Jesus’ hidden – unrecorded – life God saves us, because we are no longer left alone: God has determined that he will live with people, people who are damaged and who cause damage, whatever it costs; not turning up and waving a magic wand, but committing to live-out reconciliation. By Jesus’ public ministry God saves us, showing not only what we have been saved from – through acts of salvation from sickness, demons, death – but also what we have been saved for – multiplying-out those acts of salvation. By Jesus’ resurrection God saves us, as Christus Victor, the Victorious Christ, who has fatally wounded death itself, and irreparably broken the prison gate of the kingdom of hell. By Jesus’ present intercession at the right hand of the Father, God saves us, as our advocate in the face of the accusations of the satan (the accuser). By Jesus’ future return God saves us, by ushering-in the kingdom of heaven in all its fullness, where we, reunited with him, will be free from everything we presently need salvation because of. May you know Jesus – ‘God saves!’ – more fully in 2010, in every sense.